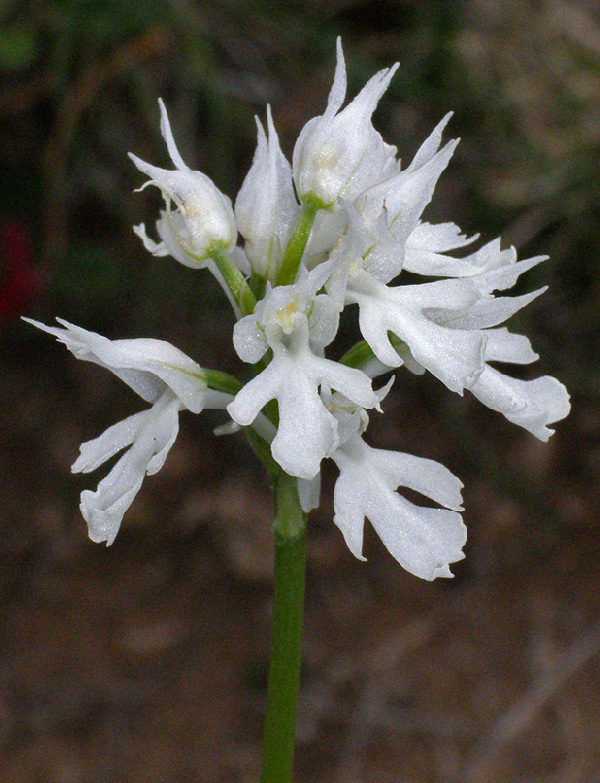 Neotinea tridentata is 20 to 40 cm tall. It has 5 to 8 foliage leaves and 2 to 3 leaves enclosing the erect stem. The spherical inflorescence carries up to 50 small flowers. All sepals and the two upper petals form a closed hood with long, acuminate ends. Sepals and petals are characterizes by violet veins. The labellum is deeply three-lobed with lateral lobes spreaded and a middle lobe with a marked tooth. The spur is about half as long as the ovary and bent downwards. Giovanni Antonio Scopoli (1723-1788) described the plant as Orchis tridentata in his opus Flora Carniolica Exhibens Plantas Carniolae Indigenas et Distributas in Classes Naturales (1772). The present name was given by Richard Bateman, Alec Pridgeon and Mark Chase in an artcle published in Lindleyana in 1997. The flowers are mostly pink to light violet. Varieties of forms and colours are quite common. H.Kretzschmar, W.Eccarius and H.Dietrich (Die Orchideengattungen Anacamptis, Orchis, Neotinea. 2007) note: “White flowering specimens (‘alba’, ‘albiflora’) are not too rare. 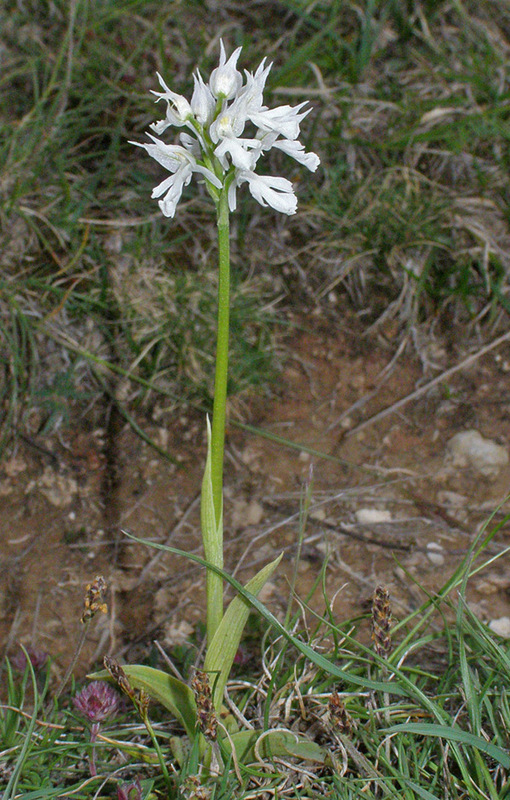 Roko Cicmir who photographed the first two plant shown here, estimates that in Dalmatia there are 1 to 2 albiflora forms among 100 plants. 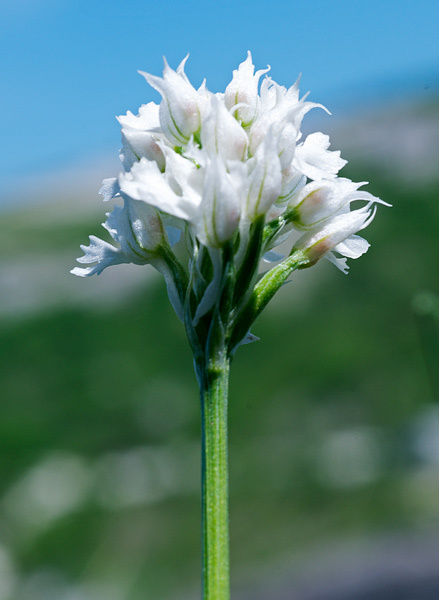 Neotinea tridentata is growing on grasslands and calcareous soils, up to 1600 m. Bloom is from March to June. The plant can be found in Mediterranean regions from South Eastern France to the Middle East as well as in some parts of Central and Eastern Germany.